Ash Wednesday (22 February) will be observed at the Chapel of Christ the Healer, Cork University Hospital this year with a novel way for patients, staff and visitors to reflect. 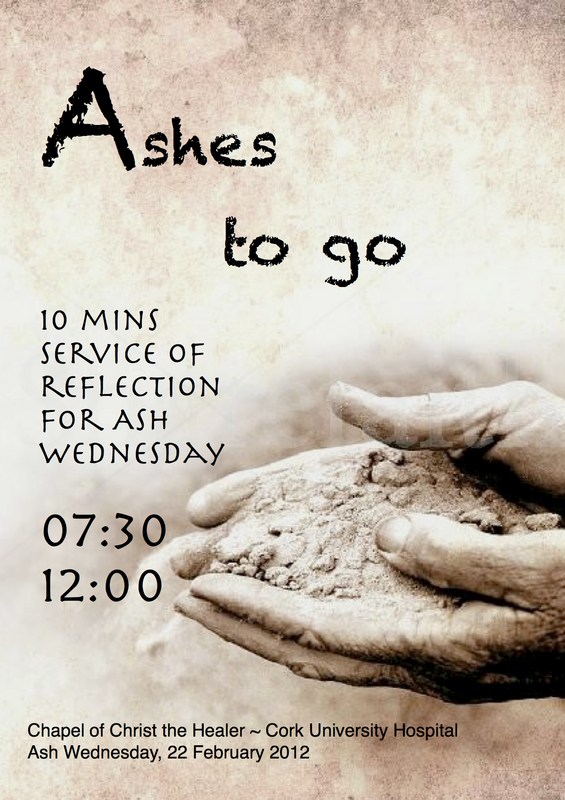 At 07:30 and again at 12:00 there will be two short services of reflection and the imposition of ashes for those who wish to receive them as a potent biblical symbol of our brokenness and mortality -themes which illness can bring into a gritty foreground of experience. Outside these times there will be reflective music, prayer cards and the invitation for all who wish to sign themselves with ash. Hospital Chaplain Daniel Nuzum says ‘recognising the reality that hospital life is busy and pressurised, Ashes to go is an ideal way to take 10 minutes out for personal reflection and stillness’. Ashes to go first started at St John’s Episcopal Church in St Louis, Missouri, USA in 2007 and is an imaginative way to meet God’s people where they are and to invite reflection, prayer and healing.